In men’s grooming, a beard trimming machine is mandatory device today. To stylize or shave men’s facial hair, there is no alternative of an electric beard trimmer. But having the perfect beard trimming kit is a challenging task. 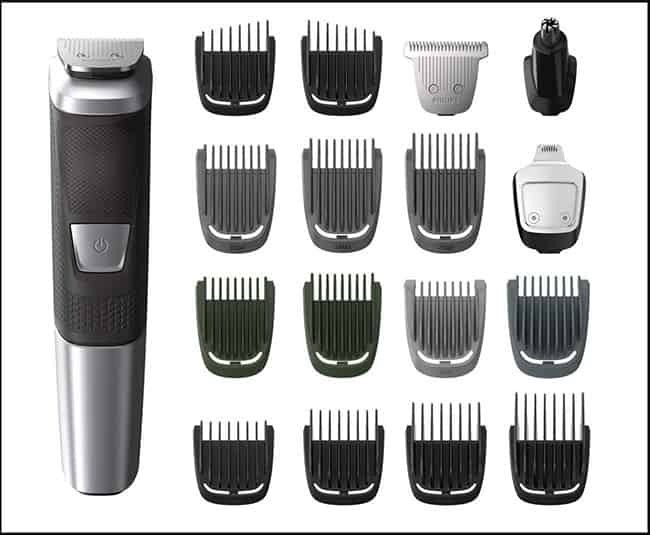 There are lots of options of different types of facial hair trimmers from different brands in the present competitive market. All the products are not good enough and can not give you the desired satisfaction. There are very few beard trimmers you can trust and rely on. So, this may disappoint you if you get the wrong one. To help you to find the perfect one, we gathered top 10 beard trimmers in our list. After lots of market research, personal and professional experiment and collecting customer’s reviews, we created this list of top 10 beard trimmers. I guarantee that you will not be disappointed after purchasing one of these electric beard trimmers. N. B: Click on the button “View On Amazon” to check the price of the specific product or Buy the product. And click on the name and picture of the product to see its features and specifications below. Philips Norelco is a popular electric shaver and beard trimmer brand worldwide. They are actually the dominating electric trimmer producer in the current market. The Philips Norelco Multigroom 7000 is their top listed beard trimmer on their trimmer line. This is not only a trimmer, it is an all in one men’s grooming kit. While listing top 10 beard trimmers, this trimmer took maximum priority with its quality and features. This is also a top rated and top seller trimming kin on the market. Features and Specifications of Philips Norelco Multigroom 7000. A package of 23 pieces trimming and grooming elements for the whole body. The precision blades come with Dual cut technology which includes 2x more self-sharpening metals to keep the blades super sharp year after year. The motor of Philips Norelco Multigroom 7000 is reinforced with tempered steel to deliver the maximum power of trimming in every stroke. All the cutting guards are reinforced with ultra-strong fiberglass materials to keep them super strong in every operation and protect them from bending and buckling. There are 2 stubble guards (1mm, 2mm); 3 beard guards (3mm, 5mm, 7mm); 1 eyebrow guard (6mm); 4 hair guards (4mm, 9mm, 12mm, 16mm); 2 body guards (3mm, 5mm); and 2 fading guards (4-9mm) with this package. The Multigroom 7000 comes with a powerful Lithium-ion rechargeable battery which provides 5 hours of operating time in 1-hour charge. The trimmer is 100% washable, so you can clean the trimmer and parts with direct running water and also trim the wet beards. Philips Norelco 7000 comes with stainless steel body and the comfortable rubber grip on the top which ensures the long durability of the trimmer and a comfortable control. The main trimming head will be set on the head of the trimmer which is for trimming the beards in different length with different attached combs. There is a foil shaver head with the trimmer package to shave the outer hairs of the beard and make the beard clean and smooth. And the main task of this head is to shave the full body hairs. There is a narrow precision trimmer for the small detailing and shaping the sideburns. The Philips 7000 trimmer includes a nose and ear trimmer to remove the unwanted hairs from inside the nose and ear. There is an extra-wide hair trimmer which is for trimming the long beards and also the head hairs. The trimmer has a quick charging option to have a trim urgently with 5 minutes of charge when the battery is fully dead. This is a worldwide voltage(100v-220v) supported trimmer. So, you can use it anywhere in the world. Philips offers 5 years of warranty for this trimmer. Panasonic is another giant company for electric shavers and beard trimmers. The Japanese popular producer has lots of models for electric shavers and beard trimmers and the Panasonic ER-GB80-S is the top quality product in their beard trimmer line. This trimmer offers lots of options with lots of length settings for a perfect trim. If you need to make a stylish trim of your beards or hair and also trim the body hairs, this would be a great device for you. Panasonic ER-GB80-S achieved the Men’s Health Grooming Awards in 2015. The Panasonic ER-GB80 beard trimmer comes with stainless steel super sharp hypoallergenic blades which stay sharp year after year of use. The blades are 45° angel precise to capture the hair perfectly in different length and provide a smooth and fast trim. There are 2 adjustable beard trimmer combs which provide 39 precision settings with a wheel on the body of the trimmer to trim the beard and hairs 5 to 20.0mm length. And 1 black comb for close body trimming. There is a 45° slide up trimmer on the front of the trimmer body to make a detail trimming for your mustache, sideburns, and eyebrows. 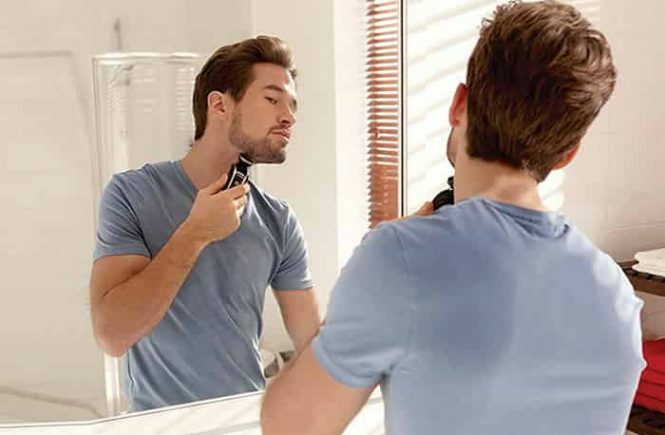 The Panasonic ER-GB80-S beard trimmer comes with a powerful rechargeable Ni-MH battery which provides 50 minutes of continuous cordless trimming with a single full charge. You can use the trimmer corded too when the battery is fully dead. But you must ensure that the trimmer is fully dry while operating corded. There is a 3 stage LCD display on the body to show the charging status and power status of the trimmer. The trimmer comes with the worldwide voltage(100v-240v) supporting adapter to charge the shaver anywhere of the world. Panasonic ER-GB80-S is 100% washable, so you can clean the shaver easily with the running tap water. The trimmer comes with an ergonomic design and all the sides except front side are rubberize to ensure a secured grip to protect the trimmer from any accidental falling down even your hand is wet and slippery. Panasonic offers 2 years of warranty for this trimmer. Wahl is the ancient company and they are producing electric trimmers and hair clippers from 1919. They claim that they are the no. #1 brand in their type on the present market. As you know, they have lots of beard trimmer and hair clipper models on the market currently, I think the Wahl 9818 is the best one of their production ever. The quality and features of this trimmer deserve a better position of our top 10 beard trimmer list. Wahl 9818 is a 4 in 1 device for trimming your beard, shaving your body and stubble, detailing and removing unwanted hairs from nose and ear, and making a haircut. There are 4 different attachment heads with this trimmer ( 1 T-Blade or the main trimmer head, 1 Detail shaver, 1 Precision detailer, 1 Nose and ear trimmer). The trimmer comes with stainless steel self-sharpening blades which stay sharp year after year and provide fast and super sharp performance. The body of the shaver made with stainless steel to make the shaver ultra durable and super secured. There are 12 attachment guards in this package (1.5mm to 25mm) to trim the beard and hair from smallest to a large length. There is an amazing quick charging option in 1 minute for an urgent shave. There is an LED indicator on the body of the trimmer to show the charging and the full charge. The trimmer Wahl 9818 is 100% washable, so you can cleaning the trimmer parts and the head easily with direct running water. The charging adapter supports universal power volt (110v- 220v). And the charge will be automatically off when the battery is fully charged. 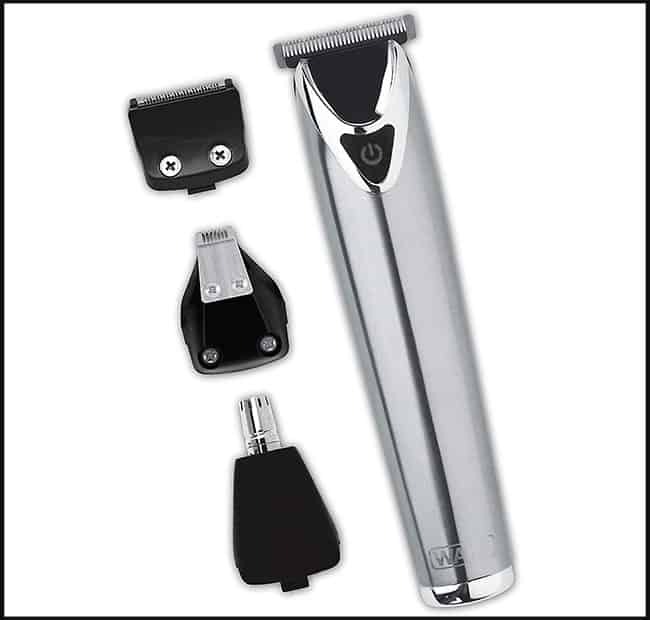 Wahl provides 5 years warranty and 30 days money back guarantee with this trimmer. The Philips Norelco 7200 is another top quality beard trimmer on the market. The trimmer has a sleek and premium design with the integrated unique vacuum system. This is a cordless and corded beard trimmer. Self-sharpening stainless steel blades stay sharp for a long time of use. The unique vacuum system of this trimmer catches up to 90% of cut hair for less mess. The powerful high-velocity motor and fan system cuts much hair with less stroke. 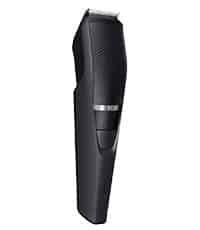 Philips Norelco 7200 beard trimmer includes lift & trim technology which allows the trimmer heads to catch and lift the hairs more efficiently and cut them for a smooth and clean trim. There are 20 built-in length settings(0.5mm – 10mm) in the trimmer for smaller to larger beard trimming. There are 3 attachment combs and 2 trimming heads in this package. The trimmer comes with the Lithium-powered battery which provides 80 minutes of cordless shaving with 1-hour charge. The Philips Norelco 7200 can be used both cordless and corded. So, you can trim your beard and hair when the battery is fully dead by directly plug in the cord. All the attachments and the head of this trimmer is 100% washable. So, you can easily clean them by direct water after every use. There is an LED battery indicator on the shaver to show the charging and power status. The adapter supports worldwide power volts(100v-240v) to ensure universal use anywhere of the world. The Philips Norelco 7200 beard trimmer comes with 2 years of limited warranty. Panasonic ER-GB40 is Panasonic’s most stylish beard trimmer on the market. 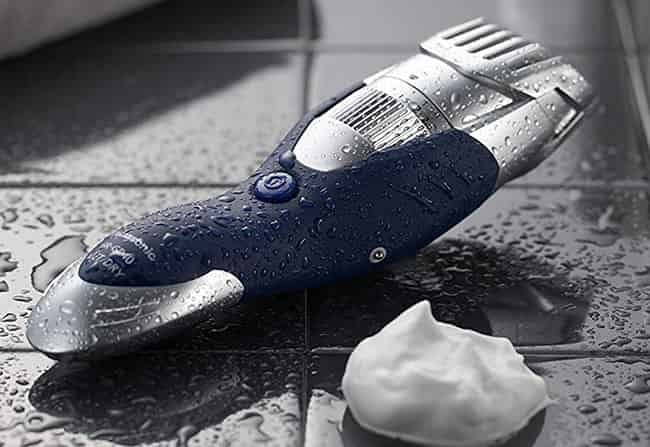 This beard and mustache trimmer comes with a combination of blue and silver color and with a dashing design. This is also a top-selling beard trimming kit on the Amazon. 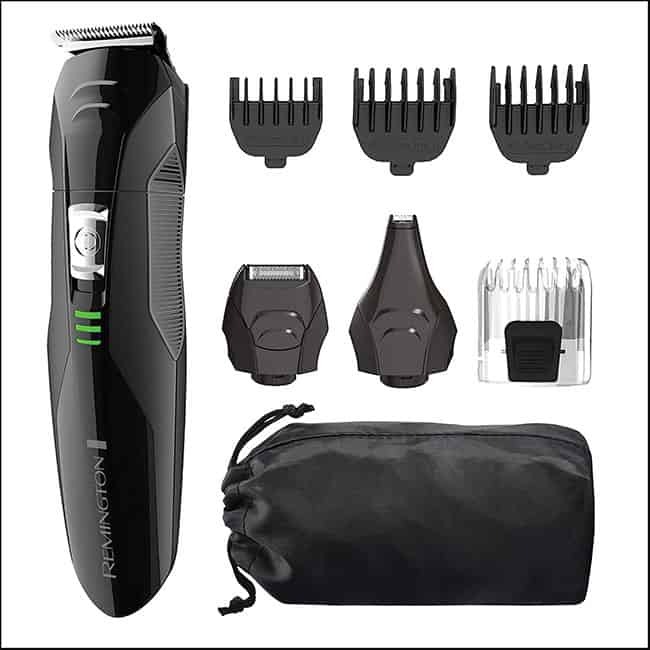 This trimmer is called Panasonic’s Milano series trimmer which got best trimmer award in 2014 for its outstanding performance and design. The Panasonic ER-GB40 comes with super sharp and ultra-durable stainless steel blades for a long-lasting and steady performance. The blades of this trimmer are 45° angel edged which can hug the hairs and catch every single hair for an efficient and smooth beard, mustache and haircut. There is a dial wheel for adjusting 19 precision settings for hair and beard trimming, sculpting, cutting and detailing. The lengths of the settings are from 1mm to 10mm for a smallest to bigger beard trim. This is a fully washable trimmer, so you can clean it easily with direct running water like the tap. The trimmer offers both wet and dry operation as you can have a smaller beard trim without any irritation with your favorite foam, gel, cream, soap or water. Panasonic made a secured rubber grip on the body of this trimmer to provide maximum security of accidental falling down and make a comfortable grasp. This is a dual supportive cordless and corded beard trimmer. So you can use this trimmer when the battery is fully dead. The trimmer takes 15 hours for a full charge which is very long. It could be a downside if you do not like a long time charging trimmer. Panasonic ER-GB40 comes with a rechargeable Ni-MH battery which provides 50 minutes of cordless use. The adapter supports 120v electric power for charging and cordless operation. That means this shaver is only made for North American countries. Panasonic provides 2 years of warranty with this trimmer only for the USA. Philips BT5210 is a 3rd generation beard and head trimmer. This is another popular beard trimming kit on the market. You will find two similar models on Amazon while buying this device. 1 is with 3 adjustable combs and another is with 4 adjustable coms and 1 travel bag. The front of the first one is silver color and the second one is shiny black color and the model in the second one will show BT5225. But the quality and features of both device are same. 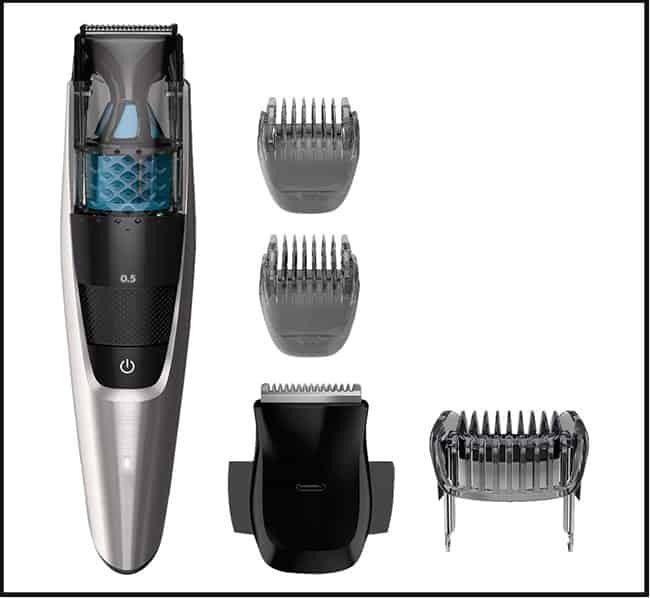 Let’s check the features and specifications of Philips BT5210 beard and head trimmer. 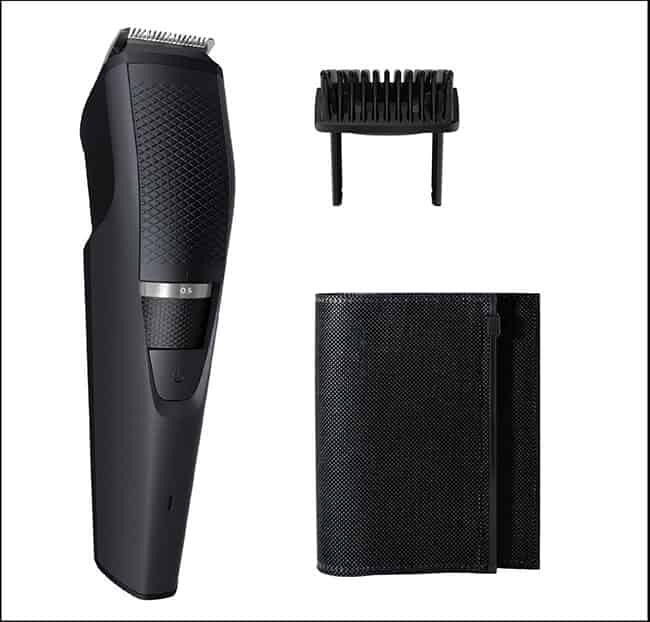 Philips BT5210 or BT5225 beard and head trimmer come with ultra-durable self-sharpening stainless steel blades which will perform year after year of use. The trimmer comes with the unique lift and trim technology which can efficiently catch and cut more hairs in the different angle. There are 17 precision length settings with the Zoom wheel on the front if the trimmer which is (0.4mm) to (13mm). 20 cutting lengths 5mm to 10mm. The Philips BT5210 beard and head trimmer comes with a powerful Lithium-ion rechargeable battery which provides 70 minutes of cordless shaving with 1 hour of full charge. There is an LED battery indicator on the body of the trimmer to show the charging and power status. The trimmer is fully washable, so you can easily clean the trimmer with running water. Philips designed the blades with extra care to protect the skin irritations and hair unrooting. This is a cordless and corded beard trimmer which offers you to use this trimmer directly from the electrical plug when the battery goes fully dead. But you should be careful to ensure that the trimmer is fully dry. The adapter supports worldwide electricity voltage(100v-240v) to use the trimmer anywhere of the world. Philips provides 5 years of limited warranty with this trimmer. Philips Launched another multi grooming series for your body, head, beard, nose, ear, and mustache trimming. In a word, the Philips Norelco Multigroom 5000 is an all in one grooming kit. 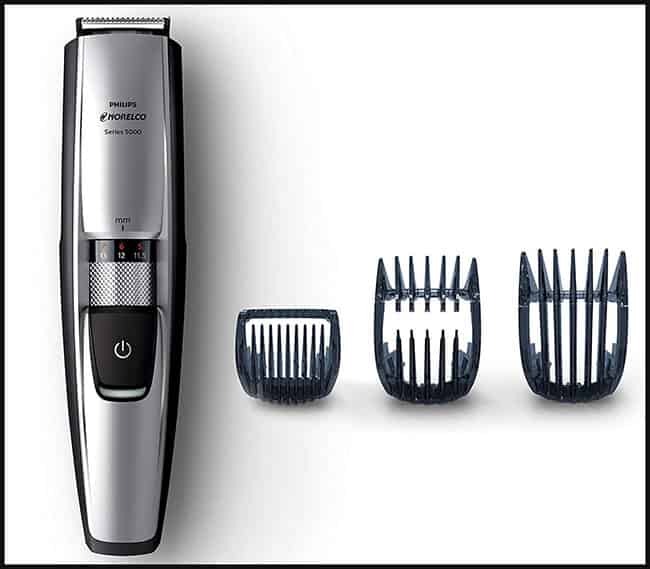 The package of Philips Norelco Multigroom 5000 comes with 18 pieces of combinations for all of your grooming needs. Let’s see the features and specifications of Philips Norelco Multigroom 5000. The groomer comes with dual cut technology to cut more and more hairs in every stroke. Philips Norelco Multigroom 5000 has stainless steel 2x more self-sharpening blades which stay sharp till 4 years of use and provide ultimate sharpness for every trip. The motor of the trimmer is reinforced with tempered steel which provides maximum torque and power for a fast and smooth trimming. There are 13 reinforced, ultra-strong fiberglass material trimming guards for the different length of hair and beard trimming which stay strong and do not bend and buck after a long time of use. The guards offer 1mm-16mm of length setting for your long and short hair and beard styling. Philips Norelco Multigroom 5000 comes with a powerful Lithium-ion rechargeable battery which delivers 3 hours of cordless use after 1 hour of charge. It is a cordless and corded beard trimmer. So, you can use the trimmer while it is plugged into the direct electricity if the battery goes fully dead. The body of the trimmer is protected with no slip rubber grip for a comfortable grasp. There is a beard trimmer, precision trimmer, extra wide hair trimmer, and nose trimmer with this package. The attachments are fully washable, so you can clean them from direct running water. Philips provides 2 years of warranty with this trimmer. The Remington PG6025 is a popular and top seller beard trimming kit on the market. Its sleek design and beautiful look with full black color catches customer’s mind easily. The price of this trimmer is comparably very affordable and that is why people accepted this product very well. Let’s check the features and specifications of Remington PG6025 shortly. The Remington PG6025 beard trimming machine comes with surgical steel self-sharpening blades which stay sharp year after year of use. There are 6 attachments with this package. 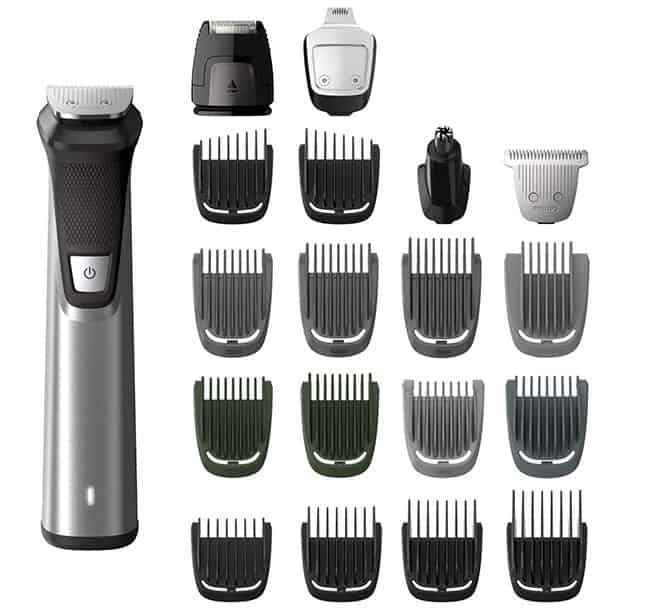 There are 14 length and style settings with the attachment combs of the trimmer. Full body is made of plastic. You can not expect a metal body in such kind of budget. The Remington PG6025 is powered by a rechargeable Lithium-ion battery which delivers 65 minutes of cordless operation. The attachments are fully washable, so you can rinse them with running water. This is not only a beard trimmer. There is a hair cutting comb with this package. So, you can cut your hair too in different length. Besides the beard and hair trimmer, there is a nose and ear trimmer and a detail shaver with this package. There is an LED display to show the charge status and power status while shaving. 120 power volt supported. It means, it is only for the American and EU countries. 5 minutes quick charging option. 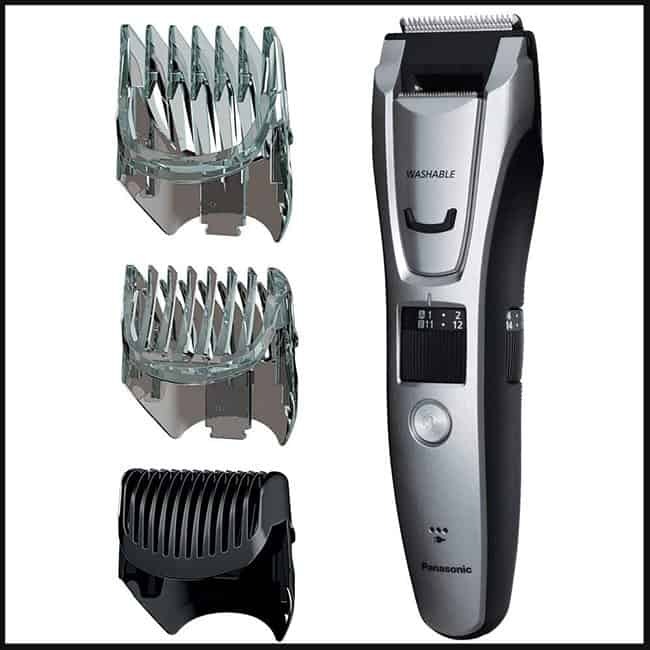 Remington provides 2 years of limited warranty for this trimmer. Philips Norelco is an accomplished brand for electric trimmers which comes again and again when talking about best beard trimming machines. The Philips Norelco 3500 is another lovely beard trimming kit in our list of top 10 beard trimmers. 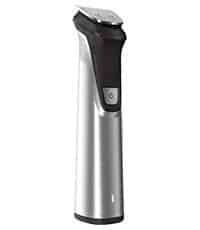 This trimmer comes a silver and black color combination and a sleek design. 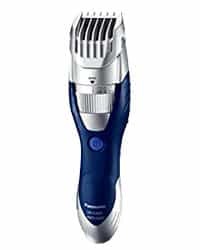 Let’s check the features and specifications of Philips Norelco 3500 beard trimmer. Titanium coated stainless steel self-sharpening blades stay sharp till the expiration of the trimmer and provide super sharp performance in every trim. The beard comb and the blades of the trimmer are made with extra care to protect skin irritations and pulling hairs and pace with the sensitive skin. There are 20 length settings from 5mm – 10mm in this trimmer with the Zoom wheel. 1 adjustable comb with this trimmer. The trimmer is washable, so you can make an easy cleaning of the head with direct running water. Philips Norelco 3500 beard trimmer is powered by Lithium-ion rechargeable battery which delivers 2 hours of cordless use with 1 hour of full charge. There is a battery indicator light to show the charging and power status. The angled design of the head of this trimmer helps to reach hard to touch areas and provide a comfortable trim. Provides 4 minutes of quick charge for an urgent trim. Philips offers 2 years of limited warranty for this trimmer. Again it comes to Philips Norelco. The Philips Norelco beard trimmer 3000 is the little monster for beard trimming and styling. The beard trimming machine comes with a sleek and beautiful black color design. For a stylish look of your beard every day, you can have this machine undoubtedly. And the price is very reasonable. Let’s check the features and specifications of Philips Norelco Beard Trimmer 3000. Ultra-durable dual-cut blades provides extra sharpness of performance in every trim. Lift & Trim technology of this trimmer catch more hairs in every stroke and provide smooth and clean trim. 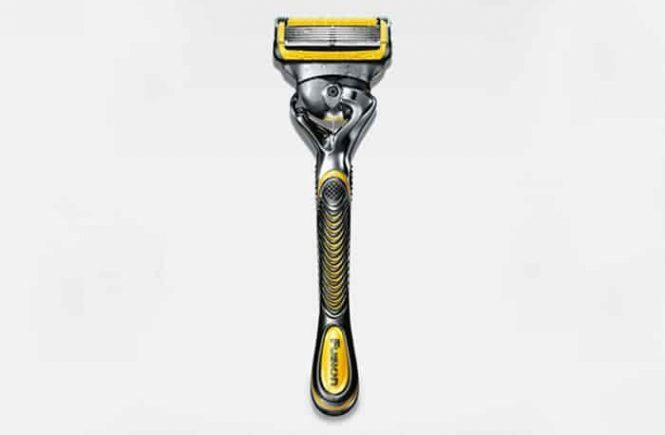 The blades are designed with skin-friendly technology for a comfortable trim and preventing hair pulling. There are 10 adjustable length settings with the Zoom wheel for the different length of beard. 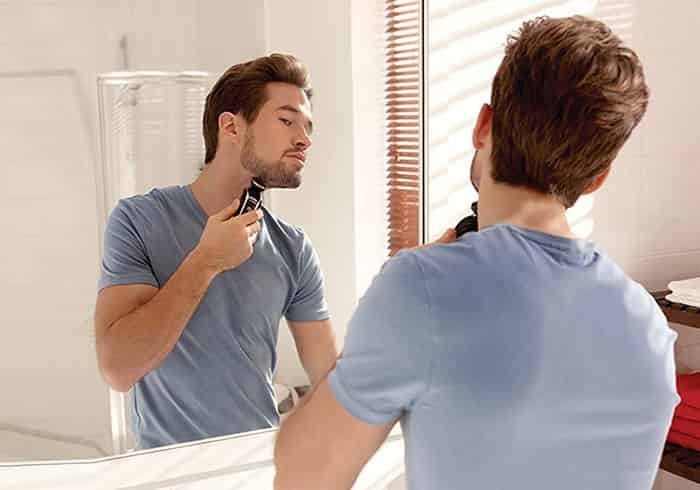 The Philips Norelco Beard Trimmer 3000 comes with a powerful rechargeable battery which provides 90 minutes of cordless operation with 8 hours of full charge. This is a cordless and corded beard trimmer, so you can use this trimmer when the battery goes fully dead. LED indicator to show battery and charging status. Washable parts allow cleaning the parts with direct running water. The ergonomic design of the trimmer allows catching every single hair for a smooth and clean trim. 2 Years of the limited warranty. 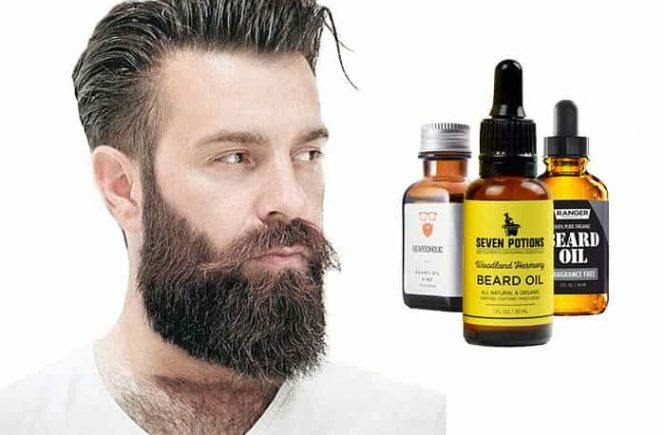 Top beard trimmers of the market are listed here and to get a good beard trimmer, you can follow our list and we can surely declare that you are going to have a great experience of beard trimming kit. Beard trimmers are not for the extremely close shave and everybody knows this. While you need to trim your beard or hairs in different shape or length, these top 10 beard trimmers are blessings for you. But when you are in need of an extremely close shave, you should choose an electric shaver rather. 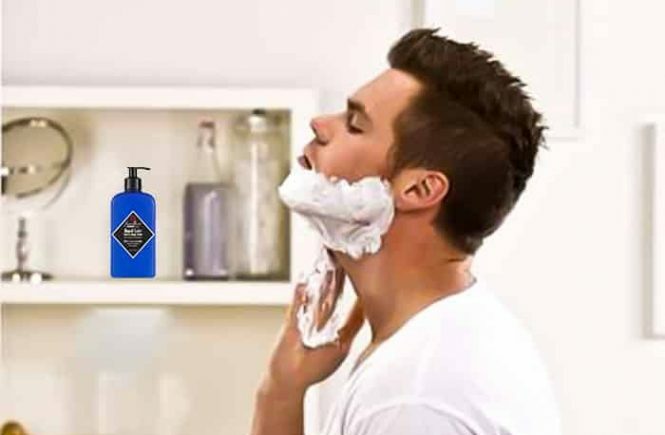 There are lots of electric shavers on the market but we collected top 10 electric shavers for men and also if you have a sensitive skin, you should choose the best electric shaver for sensitive skin according to your skin type. As the all body of Philips Norelco Multigroom 7000 and Wahl 9818 made by steel, is there any risk of electric shock while putting to the power outlet by the power cord? As we need to touch the trimmer body all the time when charge the trimmer. Not at all. 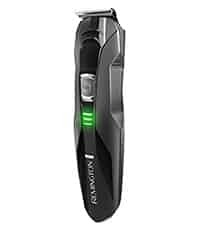 The Philips Norelco Multigroom 7000 and Wahl 9818 beard trimmer come with the powerful auto voltage adapter, which support universal voltage and deliver only the power which needs for the charge. So, there is no risk for electrical shock while charging although the body of the trimmers made with metal. I’m using the Braun bt5050 for 1 year and I’m getting an outstanding result from it. I think my trimmer is better than most of your listed trimmers and the Braun bt 5050 should be in the best 5 electric trimmers. The Philips Norelco Multigroom 7000 is just a mind hacker. It has everything what I need and provides me astonishing performance of beard and hair trimming. I found your website from Google and I need to claim it was an excellent discover.